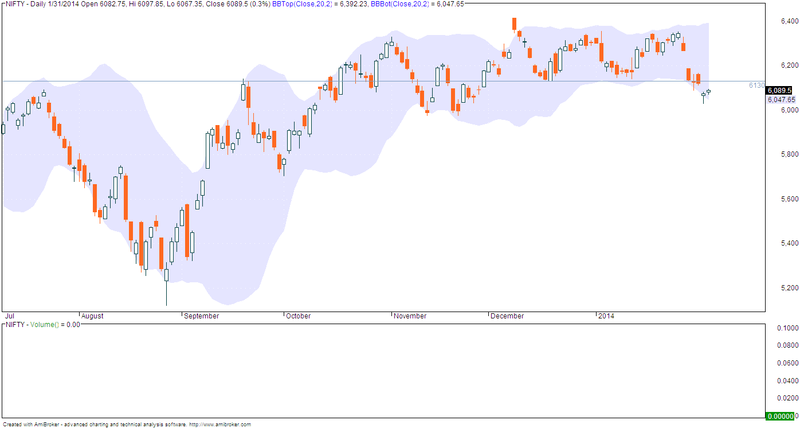 On daily charts, nifty is bouncing off the week's low but there is no evidence of any strong buying happening today. Clearly no one wants to take aggressive long positions. Trading below 6130 will mean prolonged weakness. Option writing points to support at 6000. Today we had second gap down and markets still managed to close near day's highs. Support at 6000 is still holding (actual range is 5970-6000 spot). Option writing FEB series points to support at 6000 and resistance at 6300. Expect markets to be bullish from here on as long as they trade above 6000. NIFTY has closed below DEC 2013 and JAN 2014 swing low. Levels to watch are 6100 and 6200. Below 6100, expect support at 5970-6000 levels. Above 6200, expect a weak rally which will provide opportunities to build short positions. Option writing points to support at 6000 (FEB series). NIFTY closes flat accompanied by a 5% drop in VIX. As mentioned earlier, support is expected at 6000 and this looks increasingly possible given the put writing going on in FEB series at this strike price. Note that trend is still down but some buying can be initiated at lower levels / panic with appropriate SLs in place. You will need to follow intraday charts for this and look for confirmations of some bullishness setting in. Markets open gap down and close 2% in the red. Close was near day's low and also the year's low (2-3 days before it closed at the year's high). Important support exists at 6100-6000. This level has been holding since 2-3 months. Because of this, some buying may set in at lower levels. On a different note, VIX shot up by 16% indicating increasing fear. This will however become a problem as we head into expiry week as a sudden drop in VIX + time decay can knock off premiums from the options. FEB series option writing points to support at 6000.... this is tentative and can continue to change this week. All this might mean that markets may play the fool for some more time before giving a clear direction. On weekly charts, markets are trading in an expanding triangle. This is a bearish pattern. Within this, last few weeks have shown development of support at 6100 and selling at higher levels (circled). Break of 6100 will invite further downsides. Not breaking 6100 will lead to a rangebound market. Markets closes marginally in the positive but still at year's high. Advance decline was negative. VIX dropped almost 2% indicating diminishing fear at current levels. Option writing points to increasing support at 6300. NIFTY closes at this year's highs. However this is also marginally above NOV 2013 high meaning markets have not moved at all in past 2-3 months. Now we have minor swing low at 6240 levels. Option writing points to support at 6200 level. Do nothing... just stay away for some time. NIFTY is trading in a triangle and possibly nearing the end of contraction phase. This is likely to get over in 1-2 weeks after which we will have a breakout (direction unknown). Option writing clues point to support at 6200. In futures, sustaining above 6350 will be bullish. But if we have a breakout and markets don't move after the breakout, then it means follow thru buying is missing at higher levels and this might encourage bears to start shorting the market. NIFTY is trading in a triangle. Here each rally is smaller than the previous one and so is each correction. This means that as we approach the end of the triangle, trading will increasingly get very tricky and difficult. Going solely by higher low concept, market trend is still up. This is also supported by option writing stats which indicate that writers are not expecting markets to break 6200 this month. There is still some upside left given the lack of any substantial call writing. Let me be honest upfront... this is not an original concept or approach I have discovered. While I have experienced the pain, it never occurred to me that this situation could lead to more profitable trading. This was until I came across yourtradingcoach.com - an excellent site about contrarian trades and trading breakout failures. NIFTY closes in the red but above 6200.... markets getting increasingly rangebound. NIFTY trend up as it is retesting lifetime highs. Action is getting increasingly stock specific. Advance decline is negative. VIX is not indicating any fear in option writers. Option writing clues point to support at 6200... there is however no evidence of massive call writing. NIFTY closes nicely above 6300. Now a close above 6360 will lead another round of fresh buying and possibly new highs. Advance decline was mildly positive (not a good sign). VIX dropped by 2% (bullish). Option writing points to support at 6200 and diminishing resistance at 6400. Overall clues are bullish. 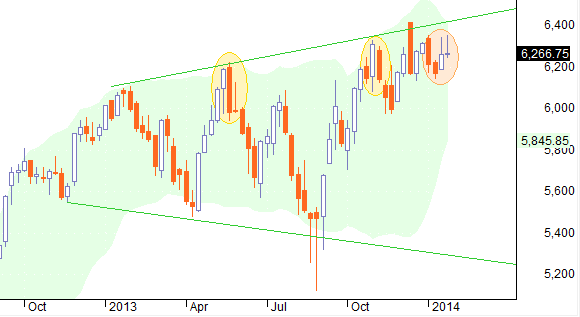 Trend is up as long as nifty is trading above 6100. Crossover above 6360 spot will be strongly bullish. Action continues to remain stock specific... unfortunately in the context of current market, it means that a lot of buy AND sell signals are failing. Within the broadly range bound market we have seen over the last few weeks, nifty closes up smartly 2% in the positive. Advance decline was good. Option writing points to support at 6200 and diminishing resistance at 6300. Action continues to remain stock specific. Today IT stocks moved... for bullish trades, look for stocks making new highs or breaking out above their 40-50 days highs. Ditto for the short side. COPPER: breakout above 460 does not seem to be holding as copper has closed below the low of the breakout bar. Stay out. Some signs of buying emerge but nifty fails to hold at day's highs. In context of the broader rangebound trading, this is a bullish sign. This is also supported by a 4% drop in VIX. This is the candlestick formed on EOD charts. The level of 6240 spot is the SL if you are short. Holding above this level will be bullish. 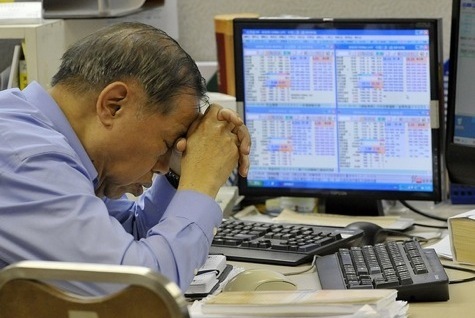 Another day of rangebound trading. No clear trend or direction visible in nifty. Option writing points to support at 6000 (first time) and resistance at 6300. This does not mean 6000 will necessarily come... it just means that option writers do not expect this level to break. Markets continue to trade rangebound... minor bullish bias seeping in as VIX remains flat and we see increase in open interest in 6000 put and a small cut in OI in 6300 call. Intraday breakout level is 6250 F as seen in chart. NIFTY closed lower today accompanied with a drop in VIX. We have support at 6100 and I am hopeful this will not break this month. Option writing points to limited upside with call writing resistance at 6300. NIFTY is still trading in a range... 6 months ago, nifty was at 6100 and today it is still there. Action is in stocks. Some signs of buying visible today. Advance decline was mildly positive and VIX dropped 4% (bullish). In futures, sustaining above 6245 will be bullish tomorrow. NIFTY trading rangebound since open... resistance developed at 6245F. Trading/ sustaining above this level will be bullish intraday. Watch for reversal of any significant bar or a breakout bar as a warning sign of possible reversal. Markets finally seem to be developing some sense of direction and that happens to be down. However a trend reversal will require far more confirmations; this is complicated by the fact that markets have been rangebound for 3-4 months and a cluster of supports has developed in the region of 6000-6100. Option writing points to resistance at 6500... this has been the case right from last week of DEC 2013. Trading range is getting increasingly smaller with markets trading rangebound. Slight increase in VIX. Option writing points to resistance at 6500 and minor support at 6300.